British travellers are urged to continue visiting Turkey but to keep away from animal markets, Jeremy Skidmore reports. British holidaymakers were this week urged to continue travelling to Turkey despite fresh outbreaks of bird flu across the country. Francesco Frangialli, the secretary-general of the United Nations World Tourism Organisation, said it was early to talk about a crisis in tourism in Turkey, or any other country, but gave warning that holidaymakers must be prepared for the virus to spread. "Despite more cases of bird flu among people being reported, no transmission between humans has been detected. No tourists have been affected, and we believe the current situation does not warrant any form of restriction or other discouragement to travel to any destination," said Mr Frangialli. 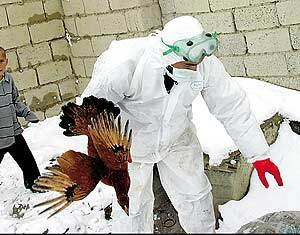 The H5N1 strain of bird flu was this week detected in north, east and central areas of Turkey. So far, two people have died and a further 13 are in hospital. 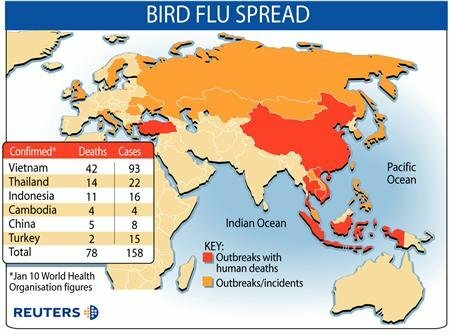 In total, 147 people have caught bird flu, of which 78 have died, since the virus first emerged in South-East Asia in 2003 and spread to China, Russia and Europe. Turkey has been growing in popularity with British holidaymakers. It lies outside the euro zone and is cheaper than many other Mediterranean destinations. In January, the peak booking period for summer holidays, travel companies had already been reporting a growth in sales for Turkey. Nick Wrightman, the managing director of Tapestry Holidays, which specialises in Turkish holidays, said: "We have sold 36 per cent of our programme for 2005, which is better than last year. But front-page stories about bird flu don't help the situation and, if it drags on, the easiest thing is for people to book holidays to other destinations. But we hope they don't do that." A spokeswoman for the Turkish Tourism Board urged holidaymakers not to turn their back on the country. "The areas where humans have been affected are in the far east of Turkey and about 1,000 miles away from the tourist resorts in the west," she said. Professor Colin Blakemore, the head of the Medical Research Council, has advised holidaymakers not to visit affected areas in Turkey. More than 300,000 birds have been culled in Turkey, and Juan Labroth, the health officer at the United Nations Food and Agriculture Organisation, has said that bird flu could spread to other parts of Europe. The virus has already been detected in fowl in the Aegean port city of Izmir, and in other birds at the resort of Kusadasi, near the Greek island of Samos. The Foreign Office said that there was no need for people to cancel their holidays to Turkey. In its travel advice, it states: "The risk [from bird flu] is believed to be very low, provided you avoid visiting live animal markets, poultry farms and other places where you may come into close contact with domestic, caged or wild birds." A spokesman for the Association of British Travel Agents also advised travellers to Turkey to avoid street markets but added: "Eating birds is not a problem, because cooking kills the virus." I have a one-year-old baby and hope for a second pregnancy soon. The potential bird flu pandemic is a worry. If the pandemic should occur, what plan is in place for treating very young children, including newborns, and what would be their chances of survival? I can understand your concern. There has been a great deal of coverage about the potential effects of a bird flu pandemic recently, including the deaths of three children in eastern Turkey last week. A flu pandemic happens when a strain of flu virus emerges (or re-emerges) to which human beings are not immune and which spreads easily from person to person, resulting in an extremely large number of cases. The World Health Organisation last week confirmed 147 cases of H5N1 in humans in Indonesia, Vietnam, Thailand, Cambodia, China and Turkey, leading to 79 deaths. Owing to the high mortality rate and the knowledge that the influenza virus constantly changes, there is concern that the virus may mutate, enabling it to spread rapidly in a population that has no immunity to the H5N1 strain. If this happens, it’s difficult to predict which age groups might be most at risk. Deaths occurred predominantly in infants and the elderly during the 1889 and 1947 pandemics, while young adults were most severely affected in 1918. The Department of Health and Health Protection Agency have taken the threat extremely seriously and are leading a co-ordinated strategy to ensure that the health service is prepared. There are two major components. First, making provision for continuing care at a time of increased need constrained by staff shortages. Secondly, antiviral medications, which may be able to reduce the likelihood of catching the disease, are being stockpiled and guidelines for their use developed. Current policies for preventing infections in babies and young children have not been finalised. The proposal is that children with a cough, fever and/or flu-like symptoms and a temperature higher than 38.5C would be referred to a community health professional. Any child who has had symptoms for fewer than two days would be given an antiviral medication, such as Tamiflu (oseltamivir), to reduce temperature, and fluids. Children under a year or at risk of complications should be referred to a GP or A&E department for assessment. Children who are severely ill would be admitted to hospital. There have been some concerns regarding possible side- effects of these antiviral drugs in children and close monitoring would be needed. There is currently no vaccine available to protect against avian flu but once the virus is known (which will only be after the pandemic has started), vaccine production can begin. The current strategy is to initially provide the vaccine to children who are perceived to be at highest risk, such as those undergoing cancer treatment, patients with severe respiratory, liver or renal problems and diabetics. Turkey’s avian flu outbreak is apparently spreading westward towards Europe, with a further three human cases confirmed in the capital Ankara and domestic fowl infected in Istanbul. 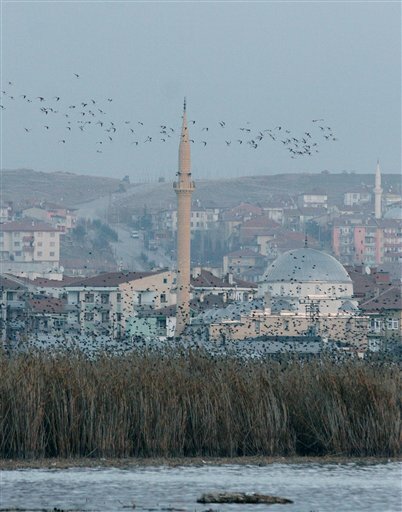 The Turkish Ministry of Health reported Sunday that five more people in that country had tested positive for H5N1 avian flu, including three people in Ankara, far from the nexus of infections to date. 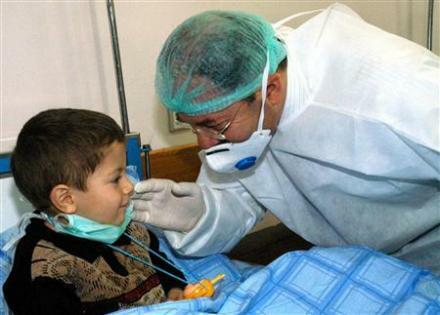 Meanwhile, a team of international experts arrived in the eastern Turkish city of Van to begin assessing how many cases exist there and whether there are any troubling changes to the pattern of human infections. And the World Health Organization served notice through GOARN - its global outbreak alert and response network - that it may need to tap member countries for additional expert assistance. WHO spokesperson Cristiana Salvi, reached in Van, told The Canadian Press that Turkish authorities had informed the team of positive laboratory tests for three people from Ankara province - two brothers, aged five and three, and an unrelated man, 65 - and two more children from Dogubayazit, a girl, aged nine and her brother, aged three. Dogubayazit, located about 170 kilometres north of Van, is the village where the first human cases in Turkey came to light. A spokesperson at WHO's Geneva headquarters said the agency needs more information about the tests used on the five newly identified cases to determine whether to accept the diagnoses. "We've been informed of those by the Ministry of Health," Maria Cheng said in an interview. "But we don't know what kind of testing was done so we're not considering those official yet. We want to get further clarification on what kind of diagnostic test they did." For the time being, the official WHO case tally in Turkey remained at four, all young children. Two have died. 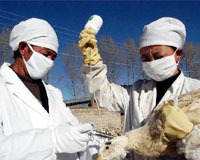 They bring the global count of H5N1 avian flu cases in the past two years to 146, with 76 deaths. A WHO collaborating laboratory in Britain has provided independent verification of three of the cases and WHO is accepting the diagnosis of Turkey's national lab for the fourth. Previously the WHO only officially confirmed cases of avian flu when one of its collaborating laboratories had verified the findings. But the organization is shifting its approach. "We are moving away from the old model in which we needed samples to be verified by an external laboratory," Cheng said. "What we're doing basically is moving towards a system where, if we have confidence in the laboratory, then we accept the results - which is the case with Turkey." More than 30 people remain in hospital in Van receiving treatment for illnesses that bear hallmarks of H5N1 infections, Cheng said. But experience elsewhere shows that when avian flu first appears in a country or region, increased surveillance produces a spike of suspect cases, some of which may later be ruled out. Some members of the team of experts that arrived in Van late Sunday headed to the hospital there to begin the work of helping to determine what the actual case count is. The team had hoped to make the journey Saturday, but was forced to remain in Ankara because of a winter storm. Officials in Geneva have already begun the process of providing them with back up, if it is needed, and will likely send reagents used in testing as well as lab equipment, Cheng said. "We just really anxious to get information," said Michael Perdue, a scientist with the WHO's global influenza program. "We're gearing up. But we don't know exactly how many people we need to send and what resources they really need." Countries that help WHO in such cases have been alerted through GOARN that a call for additional expertise may be coming soon. Backup might include experts in hospital infection control, Cheng said. If human-to-human spread of the virus is occurring, experts would expect to see some cases among the health-care workers caring for avian flu patients. To date, there have been no reports of infections in health-care workers, Perdue said. Meanwhile, scientists who specialize in studying H5N1's genetic makeup were expected to be mining newly completed sequence data to see if the virus samples retrieved from the Turkish cases showed signs that the virus is mutating in ways to allow it to spread more easily to and among people. The World Health Organization says Turkish residents should not panic following the deaths of a brother and sister from avian influenza. The H5N1 strain of the flu virus has not yet been confirmed in another sister who died Friday. The BBC reports residents of Dogubeyazit, the eastern Turkish town where the three lived, have been showing up at the local hospital reporting a variety of symptoms. Twenty people were hospitalized in Van, a large city in the same part of Turkey. The deaths are the first in humans from bird flu outside of China and Southeast Asia. Doctors say there is no sign that the disease is spreading between humans, since the three siblings appear to have been playing with the remains of chickens that had been infected. 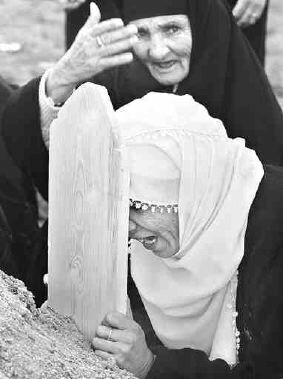 Marifet Kocyigit weeps over the grave of her son Mehmet Ali, before her daughter Hulya is buried. Chicken companies intend to test every chicken flock in the United States for bird flu before slaughter, an industry group said Thursday. The National Chicken Council said companies that make up more than 90 percent of the nation's production have signed up for testing and that more are expected to follow. WILD birds have completed their seasonal migration, and it appears that the United States has dodged the avian flu threat for now. The pattern of the semiannual migration itself provides some protection. On the three main flyways of the Western Hemisphere, migratory birds travel roughly north-south, with only relatively small areas in the Arctic and far northern regions where birds fly east-west, to and from Asia and Europe. In the Eastern Hemisphere, however, where five main flyways interconnect, the virus can spread much more easily. The route over East Asia, where the deadly H5N1 virus has killed millions of birds and at least 74 humans, overlaps with the Central Asian flyway, which overlaps with those to Africa and Europe. These long migrations increase the possibility that the flu viruses the birds carry will infect domestic fowl. This raises the odds that the virus will one day evolve or mutate to spread from human to human. The United States, Canada and Europe try to keep track of migratory waterfowl. If wild or domesticated birds are discovered to be infected with H5N1, they and those nearby can be destroyed, and uninfected birds vaccinated. But surveillance is not universal. 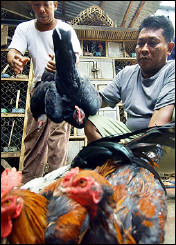 In Asia, people who raise chickens for food are hesitant to report sick birds, unless they know they will be compensated. In addition, some nations were initially reluctant to declare that a flu problem existed at all. 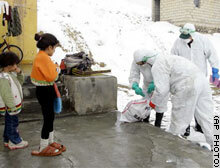 Experts worry that H5N1 will appear next in East and North Africa, where public health services are almost nonexistent. The concern is that avian flu could wipe out domestic bird stocks and that it could spread unchecked, should it acquire the ability to pass between humans. It is possible that avian flu may never pose an epidemic threat to humans. But for now, the best way to reduce the danger is to keep watching the birds.